The hotel offers a restaurant. A bar/lounge is on site where guests can unwind with a drink. A complimentary breakfast is offered each morning. This business-friendly hotel also offers a fitness center, coffee/tea in a common area, and dry cleaning/laundry services. Complimentary self parking is available on site. Econo Lodge City Centre has designated areas for smoking. Situated in Kingston, this hotel is within 2 mi (3 km) of International Hockey Hall of Fame, Queen's University, and Kingston Waterfront. Leon's Centre is 1.7 mi (2.7 km) away. This hotel features a restaurant, a fitness center, and a bar/lounge. Free continental breakfast and free self parking are also provided. Additionally, coffee/tea in a common area, a meeting room, and dry cleaning are onsite. 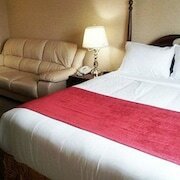 All 46 rooms provide WiFi, coffee makers, and cable TV. Other amenities available to guests include free local calls, hair dryers, and ironing boards. 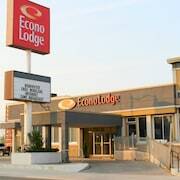 Econo Lodge City Centre offers 46 air-conditioned accommodations with coffee/tea makers and hair dryers. Cable television is provided. This Kingston hotel provides wireless Internet access for a surcharge. Business-friendly amenities include desks along with free local calls (restrictions may apply). Manhattan Bar and Grill - This restaurant specializes in American cuisine and serves lunch and dinner. Guests can enjoy drinks at the bar.